i was 20 years old when i entered my first Sephora. it was a makeup mecca and i quickly fell in love. aisle upon aisle stocked with every makeup brand or item you could think of. on organized end-caps you would find neat little jars filled with q-tips, tissues, makeup remover and a lighted mirror. think of it as your own personal vanity. my heart was racing as i browsed the rows of glossy beauty bottles and thoughtfully considered my purchase. i was 20, living on my own in Seattle which meant my budget for makeup was next to nil. combine that with the fact that the only makeup i wore when i was 20 was liquid eyeliner and mascara, my makeup needs were next to nothing. regardless, there is something about makeup that just beckons you. the promise of looking younger, prettier, better are all waiting for you in a little tube packaged in a shiny box. this was during the days of JuicyTubes by Lancome. EVERYONE had a JuicyTube. movie stars used them, Jessica Simpson was always sporting one on her hit television show 'Newlyweds' and every woman in town could be found reapplying their glossy gloss. after stumbling into the Lancome aisle i knew how my $20 would be spent - primarily on a lip gloss. my love for lipgloss has yet to wane. you can find at least 5 in my purse on any given day, twenty+ on vanity countertop and miscellaneous glosses stashed in every drawer and cupboard in my home. 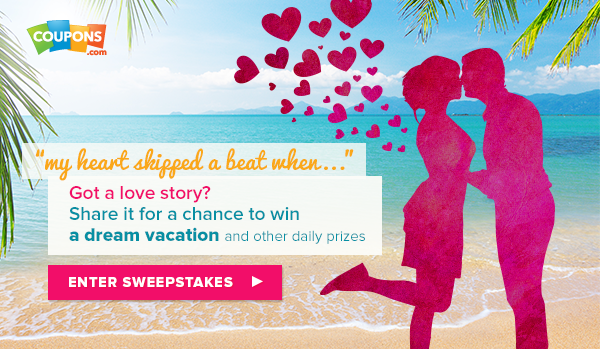 that's my love story for lipgloss and this Valentine's Day, Coupons.com is hosting a Valentine's Day Sweepstakes where you can share your own true love story for a chance to win a dream vacation. in the meantime, if your true love happens to be lipgloss as well, check out Coupons.com for Valentine's Day deals. *this post is Sponsored by Coupons.com, however all opinions, love stories and lip glosses are my own.